Beautifully restored in 4K by IndieCollect! The film covers the beginnings of the era of nuclear warfare, created from a broad range of archival material from the 1940s, 1950s and early 1960s including newsreel clips, television news footage, U.S. government-produced films (including military training films), advertisements, television and radio programs. News footage reflected the prevailing understanding of the media and public. Though the topic of atomic holocaust is a grave matter, The Atomic Cafe approaches it with black humor. 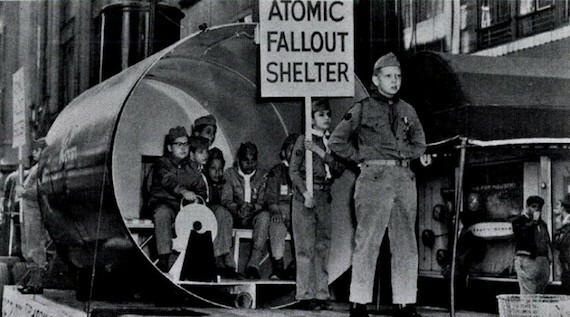 Much of the humor derives from the modern audience’s reaction to the old training films, such as the Duck and Cover film shown in schools. A quote to illustrate what can be perceived as black humor, culled from the movie: “Viewed from a safe distance, the atomic bomb is one of the most beautiful sights ever seen by man,” a U.S. Army training film declares.